Museum Weddings in Connecticut are a unique experience. Museum Weddings in Connecticut at the Wadsworth Atheneum Museum of Art are even more special. The Wadsworth Atheneum is a magical place for a wedding, although there are periods of time when weddings are not able to be held there. 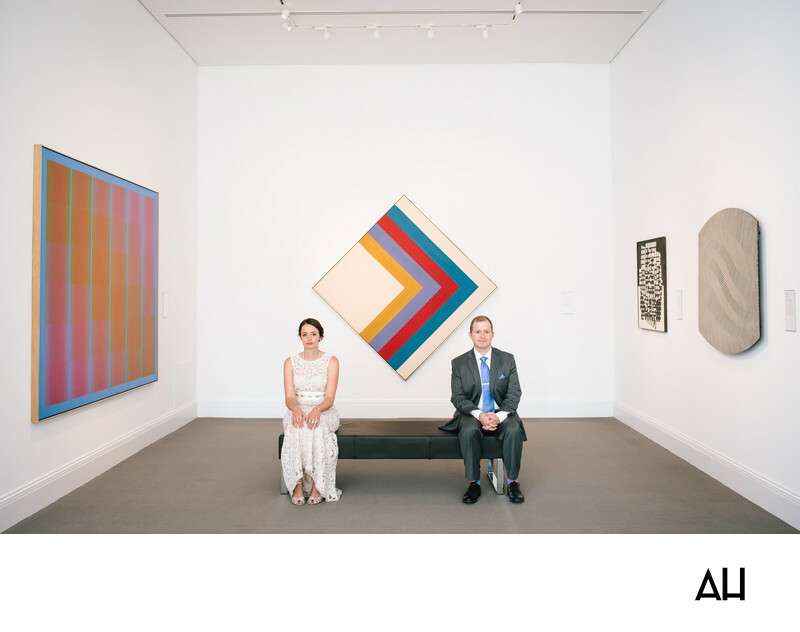 In this picture from a Wadsworth Atheneum wedding, the bride and groom sit stoically in a room that displays a few modern pieces of artwork. The photograph was taken to match the artistic nature of the couple’s surroundings, which is why they are sitting so poised and formally. The room is square in shape, a pristine white walled space with a plain stone colored floor. The groom wears a charcoal gray suit, with a white dress shirt and a bright powered blue tie. As he sits the legs of his pants rise up a bit away from his dress shoes, exposing brightly colored shocks. The bride’s gown is immaculate, an ivory dress covered completely in white lace. Open-toes white heels peek out from beneath her skirt, as she sits prettily with her hands on her knees. Both the bride and groom attempt to keep their faces neutral, but the groom’s lips twitch up a bit into a small smile. Vibrant, geometric artwork is carefully placed on the walls that surround the couple, which adds to the creative atmosphere of the picture. It is a different, nontraditional portrait of the newlyweds, but one that they will cherish nonetheless. The image preserves the ambiance provided by the museum wedding, and demonstrates the individuality of this wonderful bride and groom.